Basically two are used: the partner switching from one to the other in the course of a rally. In defence, where you lift to the rear court, you and your partner will each take up position near the centre of your service court in a side-by-side formation. Rackets outsretched to the side to cover the width of the court. Two long strides forwards or backwards enable you to return drops, smashes or attacking clears. In attack, you will take up a back-and-front formation. When, in their turn, your opponents lift to your rear court, the nearest player obviously moves back to strike the shuttle. Even as he dances back, his partner darts into the T-junction to fill a gaping void and to be poised there, ready, racket raised, before his partner even hits it. Thus, any weak return resulting from the back player's smash can be attacked by the front player before it drops below tape height. This it would certainly happen if the smasher had run in to retrieve it. The attack would have been lost. Once the attack has been gained this formation is maintained as long as either player is hitting down or playing so tight at the net that their opponents are forced to lift again and again... In this context, even a delicate net-shot or drop shot that forces a lift is an attacking shot. The net-player must try to maintain the attack from the forecourt, his partner, from the rear court. If either lifts to the rear court with a lob or clear, they have lost the attack, and they are on the defensive. And they must consequently revert to sides. But which side? If the net player lobs, he is presumably under pressure, so he drops quickly back to the nearest service court. His partner can see this and equally completes the defensive wall by moving into the other service court. If it is the rear court player who clears, the alert net player knows from his opponents last shot - and the sound of his partner's feet - where the latter is. He darts into the other service court. In theory it sounds simple enough. In early practice, where smashes are not hit down, clears are short, and net-shots high, the net player has little time to think positionally. Hopefully, a safety reflex would send him scuttling back when faced with the prospect of a shuttle in the face from the upraised racket of the mid-court smasher or net-dabber. But with experience, and more accurate shots, the changes become automatic. 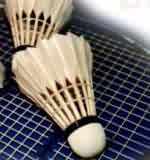 The technique and general tactical aim of each stroke has already been described. Now only a rather more specific description is needed. Men's and ladies' doubles are played with basically the same tactics. But on account of ladies' comparatively weaker smashing and slower movement there are a slight difference of approach which are dealt with at the end of this section. At the outset both pairs take up back and front positions, each optimistic that they will gain the attack. Note how important is the server's partner's role. Crouched astride the center-line, he must be able to return rushes into the body, spring forward to take half court return early; or backwards to intercept lobs. Almost as important is the receiver's partner, standing mid-court to one side of the receiver. When the latter leaps forward to attack the serve, he must be ready to maintain that initiative at the back with smash, drop or shots to the net. If points are to be won this is vitally important. The low serve to the T-junction area narrows your opponent's angle of return and, theoretically, gives you and your partner a better chance to intercept his return. If the receiver is lethal head on, move your base a little to one side, though appreciating you've left a larger gap for net return. Or serve to the side line - though now, from the right court, you've made your partner's backhand vulnerable to attack and generally opened up the angles. Always follow in thoughtfully on your low serve, watching your opponents racket keenly, and looking for a net cut-off. A well disguised flick may temper your opponent's aggression. A flick to the center runs the risk of falling into the wrong court. One to the side line opens up the angles but it does also drive the receiver from the center, gives him a rather more difficult shot to play, and, with its extra distance, gives you the opportunity to flick more crisply, and therefore surprisingly, without overshooting the back service line. The drive should at least be tried tentatively to test a suspect backhand. If nothing else is effective, a very high serve may work by forcing mis-hits from a joyous and over-confident receiver who forgets that in receiving such a serve timing is more difficult and the shuttle dropping vertically is harder to hit cleanly. Even try an angled flat drive following in for a weak return to the net. With all these variants, do be ready for a quick reply. Use both forehand and backhand serves. Your aim is to meet every low serve early - chest high in front of the front service line. So be fast and aggresive off a forward base. Don't, however, throw away a point by rushing into the net a shuttle that was above it when you moved but is below it when you hit it. Dab low serves steeply down into knees or gaps if you can. If not, use a tight net-shot to the corner most distant from the server. An admirable compromise for returning a shuttle tape-high or just below, is a deceptive half-court push. It must be fast enough to beat the incoming server yet drop short of the thrusting back player. Avoid the lob like a plague! If you must lift, do it early, fast, deep and not too high - to the backhand. In returning high or flick serves smash straight, unless you are definitely attacking the weaker player, and steeply, into an inviting gap, down the middle, or into the defender's inner side. Drops should be played to the middle, to cause doubt, or to the slower or less consistent player. Clears off a flick should be high to give you time to recover, and straight if you feel better equipped than your partner to deal with the return. In this server-receiver battle the odds are stacked in your favour. Gain the attack...and keep it. At the net If rear court attack is to be effectively backed up you must have your racket up and be on the balls of your feet. Yes, literally, you have only a split second to make your interception. Watch your opponent's action and racket head at impact to get an early warning start. Strokes played are much as in the return of a low serve: the dab and the upward net-shot. If the latter is returned with another net-shot, don't, in blind panic, lift. Keep it on the net - unless your opponent is altogether too good for you there. Try not to be drawn right out to the side-line or you will be swiftly cross-courted. Reach for the line with foot and racket and you will still be placed to cut off a cross-court reply. The best form of defence is attack. By anticipation and agility meet drop-shots early enough to turn them into lift forcing net-shots, or even hit them down for a winner. If lob you must, then fast, to a length, and to the backhand. Be prepared for an occassional flat attacking clear - spring back and attack with smash or drop. Push back dabs from the net flat with quick reflexed arm action away from the menacing net player. The smash is the big gun you must spike. If it is sluggish and flat, move in and push, or drive flat and fast into the smasher's body or witheringly cross-court. Or move in further still, to dab in crouch defence. If it is powerful, drop back to draw its sting a little - but beware of drops to the now exposed forecourt. You will have to lob but at least swing your opponent from side to side, its tiring and error provoking. Try and ensure length. Low serves will be returned to the net more often than rushed and fast lobs to the backhand may be played more effectively and safely. Since defence invariably over-rides attack, smashes should be steeper, more accurately placed and played from less far back. Flat clears, especially to a frail backhand, are useful alternatives. Drop-shots can be used with less fear of fast interception. Net play becomes even more important. Tight net-shots may force the necessary short lift or be winners in their own right. As the back player's smash will not normally be strong enough to summarily end rallies, quicksilver foot work and fast reflexes are essential to administer the coup de grace. Always keep alert!